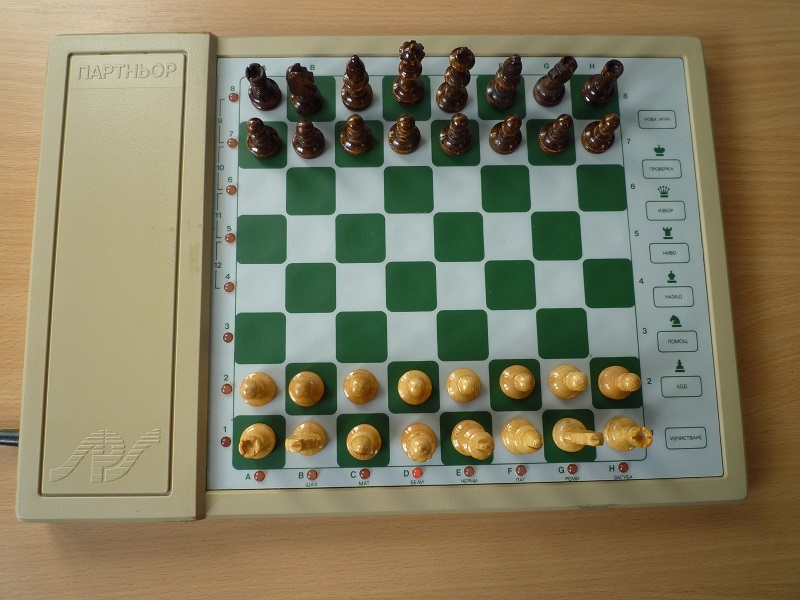 This is a Bulgarian chess computer. 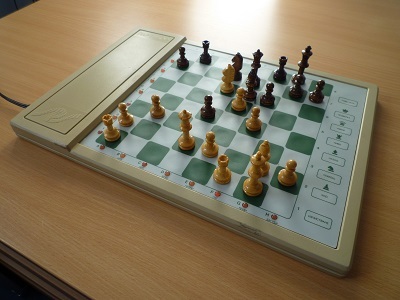 As far as I know, one of only two chess computer models to be manufactured in Bulgaria. The other is the IZOT U30M 1042C. 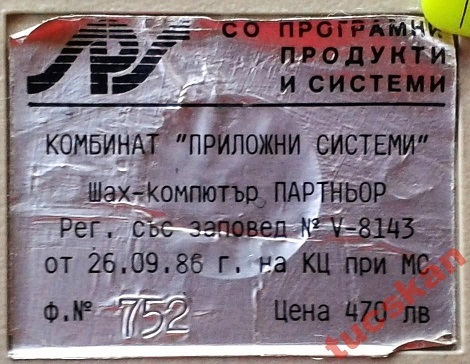 Based on the Serial Number label on the back of the machine this example was manufactured on 26th September 1986. The ‘Operations Manual’ is dated 1987. 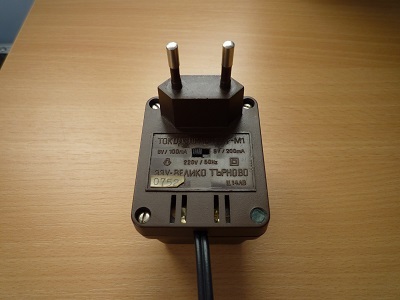 SPS (Software Products and Systems) Partner seems to be very rare, at least it is outside of Bulgaria. I have noticed only one other sold on Ebay, back in 2009 (see here), and have yet to spot one in collection lists. 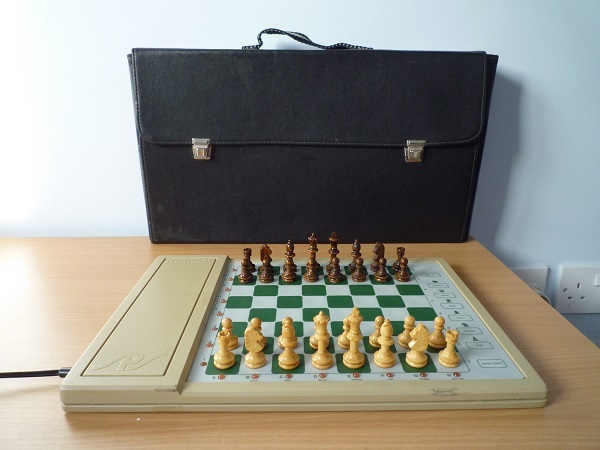 As is true of most Eastern Block electronics the SPS Partner appears to be a well made solid machine, well presented in the leather case which has compartments for the chess pieces and adaptor. However the small wooden chesspieces, apparently original equipment, look out of character with the rest of the machine. 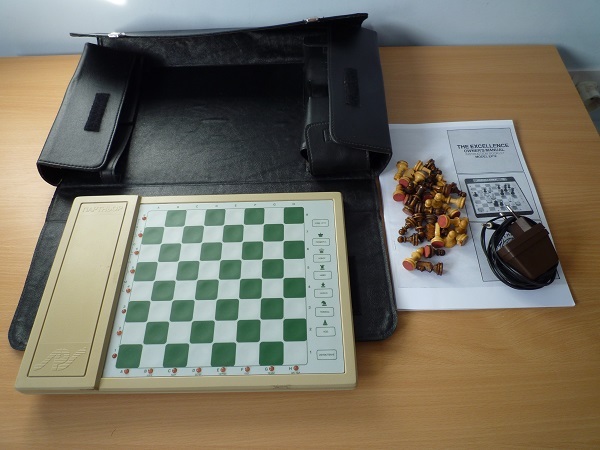 It is becoming clear that during the 1980s Eastern Bloc electronics manufacturers shamelessly pirated western electronics, including chess programs. So it will be no surprise that the SPS Partner is a direct clone of the Fidelity Excellence. 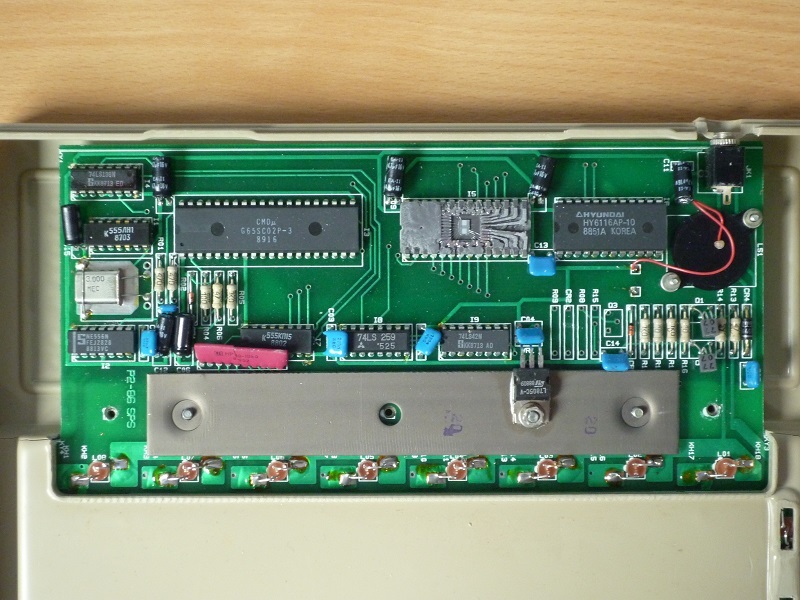 In this case the SPS has the same processor (65C02 running at 3MHz), 16KB ROM, 2KB RAM and Kathe and Dan Spracklen’s Excellence program. The buttons all perform the same functions as on an Excellence, including apparently all the same options. The machine reacts the same and sounds the same. The LED lights are a harder to distinguish pink rather than the Fidelity bright red. In a test playing the SPS Partner and Fidelity Excellence side-by-side the two machines played enough identical moves in exactly the same time to lead me to believe they probably have the same hardware and software. Further tests would be needed to establish if the SPS Partner is a 100% clone. Unfortunately a Bulgarian computer website which included pictures of the SPS Partner, a pdf copy of the User Manual and a note on the hardware (‘Operations Manual’) seems to have closed down.